Always wanting to learn more, I contacted Kitty Hanson of the Santa Fe Trading Post about my suspected Gay Fad juice set. I went to your site and enjoyed the article and photo of your Anchor Hocking juice set with the hand-painted oranges. My opinion is that you may well have an early Gay Fad orange design, but that’s going to be difficult to definitively prove. However, I can add a few more clues. We know for sure that Fran often painted her GF designs on Anchor Hocking blanks, and I, too, have found what seems to be authoritative information that AH’s Manhattan pattern was produced from 1938-1943. So if your set is by Gay Fad, that would mean that Fran produced it in Detroit before moving Gay Fad Studios to Lancaster, OH in 1945. 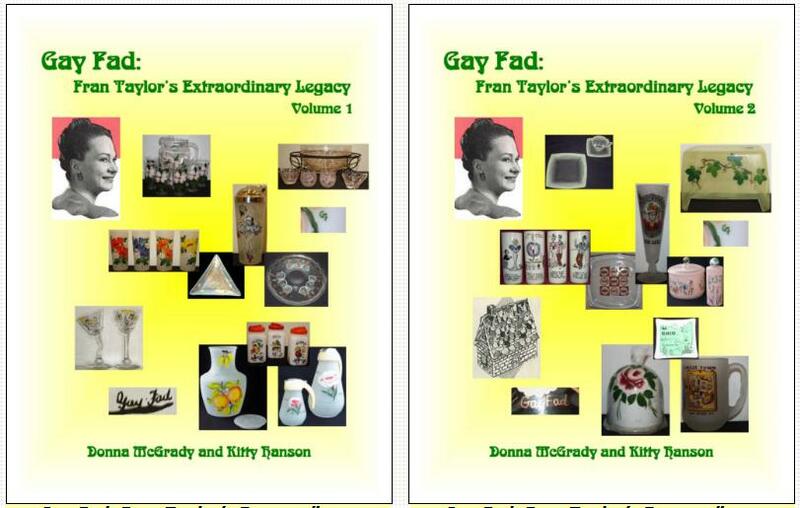 As we say in “The Fran Taylor Story” chapter of our book (page 5, volume 1), we have yet to discover a newspaper article about Fran or Gay Fad or a Gay Fad ad dated prior to 1945. But we do know that all of her Detroit work was done with “cold painting” because she didn’t have the ceramic paints or equipment necessary to do fired designs until moving to Lancaster and installing a lehr in her new production facility. Obviously your set is “cold painted” and that accounts for the flaking paint on your juice set. Interestingly enough, Red Burn (Fran’s first husband and GF vice president) wrote an article for the July, 1949 issue of Crockery and Glass Journal where he explained the difference between cold painting and fired painting and the fact that cold painting has durability issues. That article is reproduced in the “Gay Fad Articles” chapter (page 180, Volume 2). We also know that Gay Fad produced a variety of Orange designs over the years, and we show pictures of 10 of them in the “Gay Fad Designs – Identified” chapter (page 103 of Volume 1). Our earliest example is from a GF ad in the February, 1947 edition of Crockery & Glass Journal. Your design is different from any of the ones we show, but again, we have only three pre-1945 examples of Fran’s work: a Rose design lamp she gave to her brother as a wedding present in 1941 (page 4, volume 1), a Fruit design recipe box she gave to his wife during the early 40’s (page 5, volume 1), and one of the wastebaskets that “started it all” (page 3, volume 1) cut from a photo in the “Beauty and the Baskets” article in the June, 1947 edition of American Magazine (full article on page 169, volume 2). Another reason why I think your orange design is probably an early GF piece is because of the squiggly stem on the bottom of the orange on your carafe. The fruits (apple, pear, grapes) on Fran’s early 40’s recipe box clearly have squiggly stems, as do many of GF’s various fruit designs, including some of the various Orange designs. In addition, several of the GF Orange designs are painted in orange and yellow similar to yours. Donna has a similarly-shaped carafe/pitcher (NOT the ribbed Manhattan pattern) with a double orange design in orange and yellow, plus a squiggly bottom stem (page 103, volume 1), all of which looks very much like your single orange. So again, my opinion is that your set may well be an early Gay Fad orange design, but that’s going to be almost impossible to prove – at least at this point in time. I was pretty sure the vintage glass was cold-painted, but honestly, the texture and flakes had me confused… All the cold-paint pieces I have are vintage ceramic pieces, and there the paint appears more “slipped off” and not something that you can feel like you can on this set. (But then again, who knows how it was taken care of? An idiot putting the vintage glassware in a dishwasher back in the 1980s?! I’ve seen damages from dumber things.) I didn’t think the art glass was decorated with decals; there’s no film or lines surrounding the fruits and leaves; and you can see paint strokes and layers, especially behind the clear glass. But there are transfer processes too… Glassware can be so confusing! But Miss Kitty’s information makes sense. The dates of the vintage Depression glass coincide with Fran Taylor and Gay Fad’s early years during which the cold painting was done. Likely there was some experimentation with different paints and processes. Conditions, like on this set, will be an issue. But I’m rather charmed by signs of use and the notion of a woman starting her business. 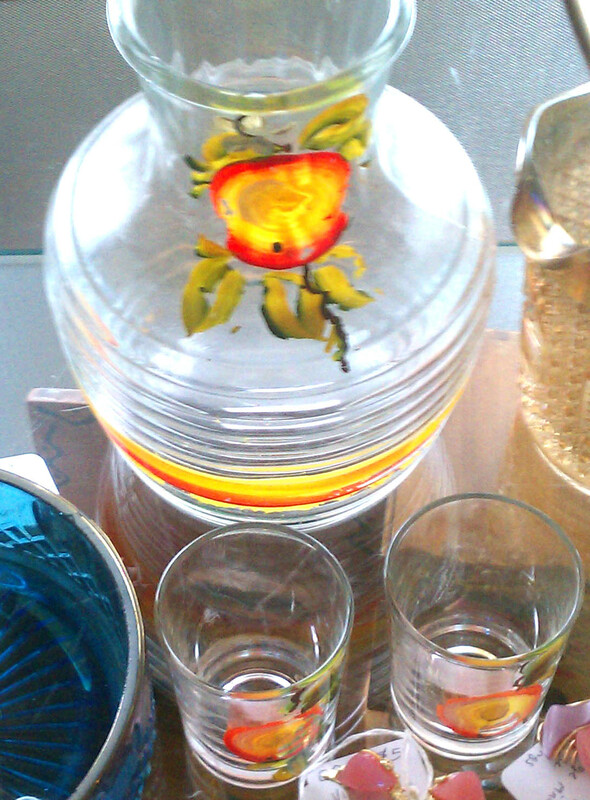 I have some frosted glass juice glasses and a small pitchure that are hand painted. I am trying to verify that they are by Fran and are early Gay Fab. I have red your letter and i think they might be early before she moved to Lancaster , Ohio. I am not sure where they came from. I know my mothrt-in-law’s mother moved from Ohio to Oklahoma And could have been given them as a present ? Or do you know how I could verify their maker? They are Anchor Hocking because they are marked. They are painted with fruit and. Two are messed up because they have been washed, which makes me think they were cold painted. I enjoyed your info on your Gay Fad glass. Do you have the contact info for Miss Kitty to buy a set of books from her please. Previous Previous post: What Is Mid-Century Modern?